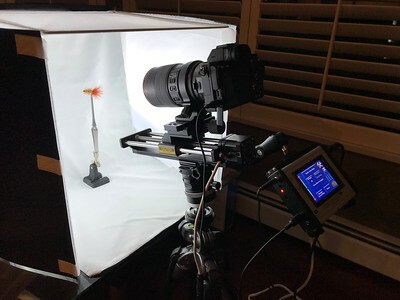 Your planning a product shot or a stills image, (eg: traditional bowl of fruit) or perhaps, a tight scene in the forest, (under a log on a wonderful village of mushrooms), or perhaps, a macro shoot such as the one to the right, photographing locally hand made fishing fly's! One of the challenges will be getting sufficient depth of field in the image to get everything you want in focus to be in focus! Simply click the picture to the right or this Depth-of-Field link and it will take you to an afternoon of testing a number of different ways to capture higher Depth of Field images.